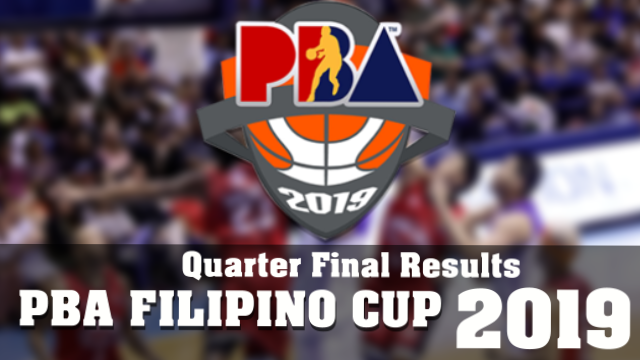 Manila, Philippines – PBA All Filipino Cup 2019 Quarter Finals started today, there are 8 teams competing each other the top seeded Phoenix Fuel Masters will have a twice-to-beat advantage against the lower seeded Alaska Aces, tomorrow, April 07, 2019 together with the clash between Rain or Shine and NorthPort whom Elasto Painters with a twice-to-beat advantage . On the otherhand there are 4 teams will compete each other in opening of the Quarter Finals today, April 06, 2019, San Miguel Beermen vs TNT Katropa, together with the clash between Barangay Ginebra San Miguel and Magnolia Hotshots in a best of 3 series. Below are the full results of the Quarter Final games. Bracket A, composed of the top seeded Phoenix FuelMasters, San Miguel Beermen, TNT KaTropa and Alaska Aces. Phoenix Fuel Masters will have a twice-to-beat advantage against the lower seeded Alaska Aces. Bracket B, will also have the top 2 seeded Rain or Shine Elastopainters including Barangay Ginebra, Magnolia Hotshots and the North Port Batang Pier. Rain or Shine had a twice-to-beat advantage against NorthPort.